Note: This post assumes that you’re working against the NuGet bits as of 4/5/2012, in which OData support is limited to $top, $skip, $orderby, and $filter. I plan to go back and check whether the latest bits already have $inlinecount support now that the ASP.NET Web Stack has been open-sourced. Update: Moving older updates to the bottom of the post. Short version: this worked in theory, but absolutely has quirks as it is admittedly an experimental hack. It explodes if you use EF (initial testing did not). Use with caution. There’s also a comment from Marcin Dobosz if you’re interested in what the Web API team is looking at for OData support. 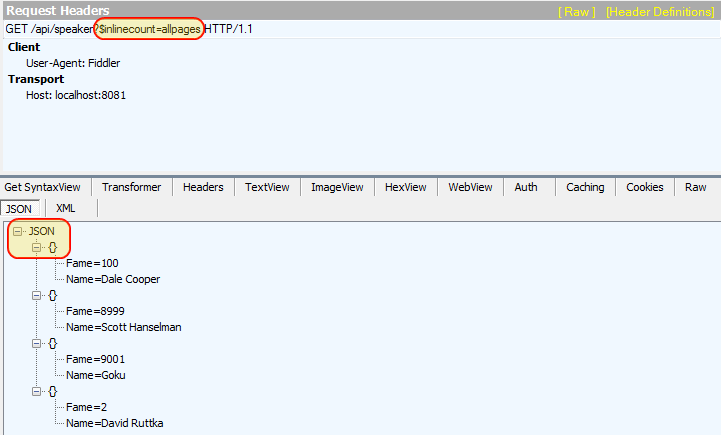 As the note above implies, the ASP.NET Web API does not (or did not) support the $inlinecount OData parameter. Many have pointed out that this defeats much of the client-side paging advantages of OData. Indeed, a friend of mine has personally run up against this. He wants to show the user how many total pages are possible; he can say that page six should be “skip 50 and take 10” all day long, but without the total count, he cannot calculate the maximum page number. To demonstrate the problem, take a look at this Fiddler request. 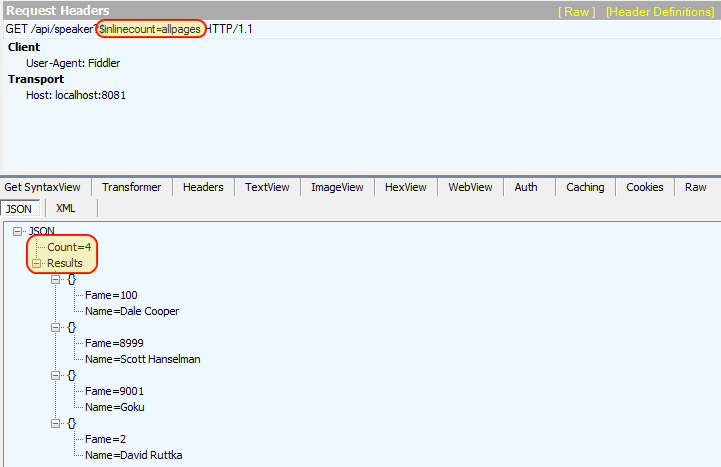 We ask for the total count of items, but the default ASP.NET Web API bits do not deliver the information! 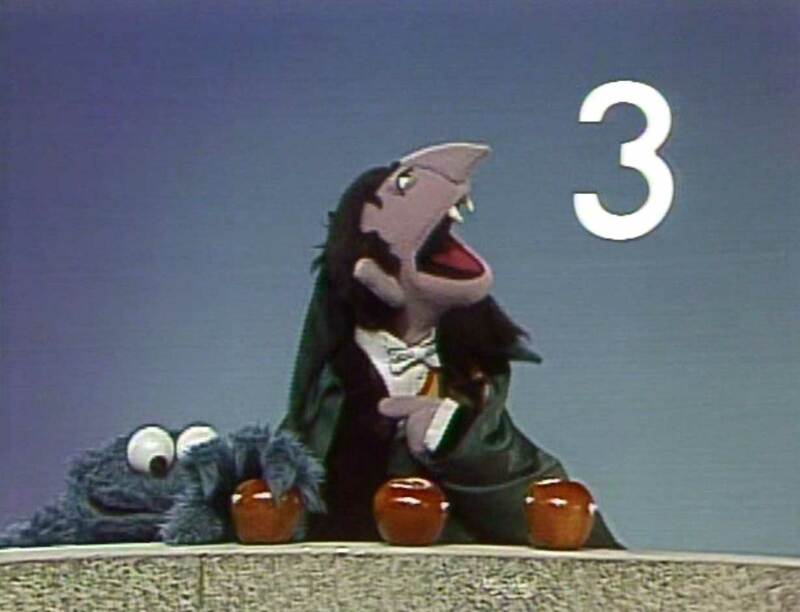 When we’re done, we will have the count! Even if we apply a filter and a skip / take, we will know how many results we should plan to receive if we page through everything. Now we can divide that by the page size and know exactly how many pages the user can choose from. [Aside: The merits of pagination are not the topic of this post. While I tend to agree with Jeff Atwood that paradigms are shifting, many still prefer – or are bound by their customers – to provide a page list]. One way around this was to simply make a second call to the server, parse out the $filter, and call Count(). This is not very elegant. While what I present below might not be the best possible approach, it does get us back down to a single call to the server which returns the $inlinecount as requested. Let’s get to the code. but this kept resulting in a 504. I decided to just go ahead and make a type to wrap our result. Trial and error also showed that our Result property needed to be an array (i.e., do not pass along the IQueryable) and cannot be object (i.e., we need to specify the proper type). After that it was just a matter of capturing the base response and adding the count in an override of SendAsync. If $inlinecount isn’t present and set to “allpages”, we just forward along the base response. Otherwise, we press on by adding a continuation to the base task. We are only going to bother working our magic if the response was a 200 OK and resulted in an ObjectContent of IQueryable<>. //Â CanÂ weÂ findÂ theÂ underlyingÂ typeÂ ofÂ theÂ results? I haven’t performance tested the following, but my theoretical understanding is we won’t be issuing any additional network traffic – this will just resend the modified request inside our own pipeline. Additionally, the additional database call should be limited to a SELECT COUNT, so not too much additional chatter. At any rate, it works, which is step one. We don’t know what custom types our controllers might end up delivering as the T in IQueryable<T>, so we get to play with some generics and dynamic invocation. Finally, we reset the Content to our ResultValue. So that’s what I came up with. You can get the full source code onÂ GitHub. You’ll want the feature/inlinecount branch. I’d be more than happy for someone to tear this apart and provide a better solution. Until then, it is what it is.Â I’ll almost certainly cover this at my upcoming ASP.NET Web API talk at HUNTUG in Huntsville, AL on 4/10/2012. Come out and see me! Update:Â For whatever reason, thisÂ breaks content negotiation to XML. If you issue requests without $inlinecount with an Accept header for XML, it’s all groovy. Issue it with $inlinecount so that we intercept and add the Count, itÂ still comes out as JSON. Be aware. Update:Â XML Content Negotiation is fixed now. Silly me, forgot to use the ctor that preserves the MediaTypeHeaderValue. Other refactorings are also present in the latest code onÂ GitHub, some of which has been incorporated into this post. Also note Marcin’s comment about the approach the Web API team is taking (still not slated for V1). Another update:Â As it currently stands, this only works in a self hosted environment. If you host your Web API in an MVC website, for example, the base.SendAsync(newRequest… results in a 404 and bad things happen due to lack of error handling (hey, I told you this was not very elegant!). Anyway, Chris tells me he can get past the 404 by copying more than just the method and Uri to the request; however, his IOC breaks after that. You’ve been warned. ;)Â This has been fixed onÂ the develop branch, althoughÂ the general warning that this isn’t elegant stands.Â Proof of concept, experiment, hack; any of these terms are very reasonable. And another: As Dante found, the “this has been fixed” part of the above update did eliminate Â the exception when web hosting, but it also destroyed the accuracy. I have reverted the source on GitHub, and this will again only work in a self hosted environment.